The ombudsman program is administered by the Administration on Aging (AoA). The network has 7,331 volunteers certified to handle complaints and 1,320 paid staff. Most state ombudsman programs are housed in their State Unit on Aging. Nationally, in 2016 the ombudsman program investigated over 199,493 complaints on behalf of 125,642 individuals and provided information on long-term care to another 378,582 people. Long-term care ombudsmen efforts are summarized in the National Ombudsman Reporting System (Click here for current NORS data) to include the number of facilities visited, the types of complaints handled and the kinds of complaints filed with ombudsmen. Data has been collected since 1996 and gives a good picture of the extent of ombudsman activities nationally and in every state. 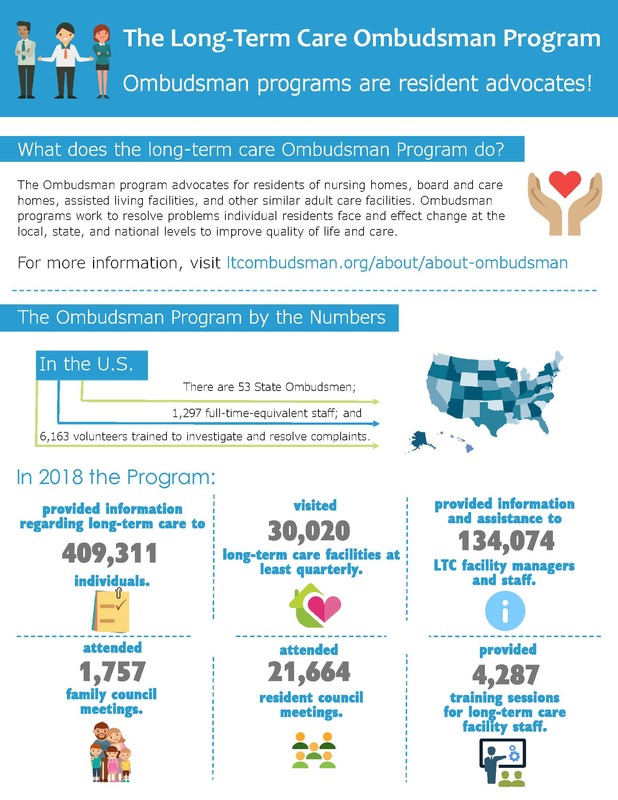 This Ombudsman program infographic has been created to give a brief overview of the work Ombudsman programs do and the impact they have around the nation. View and download the printable infographic infographic here. Long Term Care Ombudsman (LTCO) promotes quality of care and quality of life in nursing homes and assisted living facilities. Trained program staff receives and investigates complaints, advocates for resident rights, monitors facilities, educates nursing home staff and other professionals regarding long term care issues including awareness of elder abuse. Trained volunteers are needed to support the activities of this program. Call 410-396-3144 to volunteer.